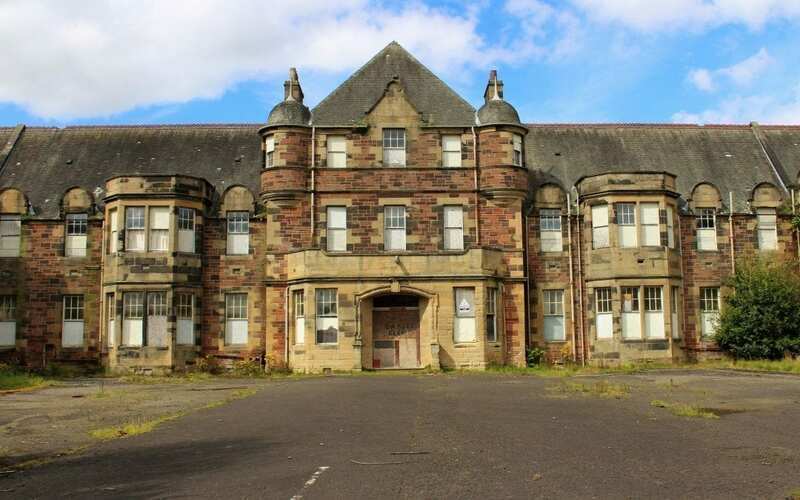 Bangour Village Hospital was a psychiatric hospital located west of Dechmont in West Lothian, Scotland. It was officially opened in October 1906 (under the name Edinburgh District Asylum), over two years after the first patients were admitted in June 1904. In 1918 Bangour General Hospital was created in the grounds, but the hospital began winding down in 1989 with services being transferred to the newly built St. John’s Hospital in the Howden area of Livingston. The final ward at Bangour eventually closed in 2004. One of the villas towards the south east corner of the site carries graffiti applied in red paint: “MY MUM PUT ME HERE!” What makes this so chilling is the knowledge that for a century this vast complex of buildings served as a mental hospital, and you cannot help but wonder about the human story behind the graffiti: and then realise that it was just one of many thousands of individual human stories that would have been played out here during the hospital’s active life. A villa in a mental hospital? In 1902 the Edinburgh District Lunacy Board purchased the 960 acre Bangour Estate. The aim was to build what for Scotland would be a new kind of mental hospital based on the “Continental Colony” system. Do you want to read more creepy details about this place? This abandoned village hospital housed mental patients and world war patients in Scotland – Bathgate is secluded and surrounded by woodlands. Gavin Bell, Shaunvlog, Erin aka BeautyCreep & Wee Scottish Lass aka MoscoMoon went to Bangour Village Hospital. The perfect place for some creepy Halloween vlogs. Check out all the creepy photos on instagram.